The target audience is people in virtual worlds and people interested in the topics cited in the issue titles. All of these topics have G+ communities (not specifically referencing virtual worlds) that might have people interested in what virtual worlds offer in connection with these topics. I would like to have several editors for each issue/section. They would get videos of appropriate content (not necessarily produce them, maybe find others willing to produce them). The videos should be about 5 min. long and tell something about the people at the location. That could be an interview with the builder(s) or a discussion/demonstration with some of the locals about how they use this place. Each issue/section would be introduced by a Talking Head show in a web-world*, featuring some of the people who have reason to be interested in the issue (editors and people in the topic). It could include conversations with people never in virtual worlds before. * That would be followed by 8--10 videos captured in a virtual world and posted on YouTube (and accompanied by relevant text, such as web links and the region address). The initial issues would be posted on my blog, Later, we might look for other outlets. The issues will be developed independently and will be published as content is developed. I will welcome volunteers for the issues/topics listed above or with suggestions for additional issues. I hope in the future the issues can be published on a regular schedule. 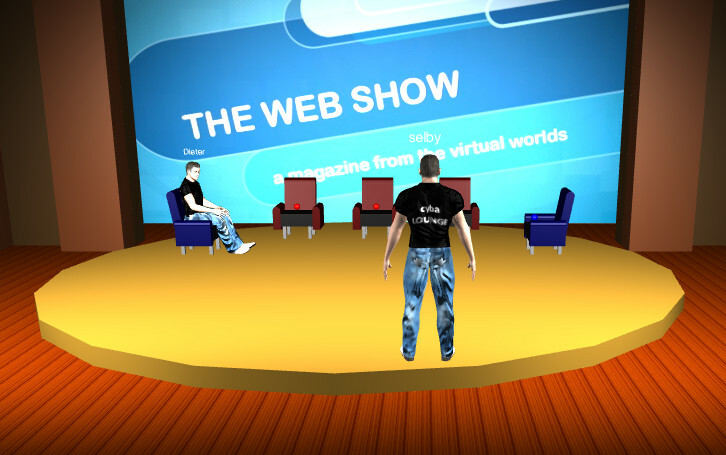 *Web-worlds are small virtual worlds reached in a browser (preferably Chrome). No viewer or registration is needed in Cybalounge. Voice is available, but we need a precheck because voice does not work with all versions of some browsers (except Chrome). Since web-worlds require no special downloads, some of the people in the web-world part of the show would be (I hope) people with no virtual world experience but interested in finding out about virtual worlds. My office times: 10:-10:30 California time, weekdays. Don't register. Click the guest login button near the bottom of the page. You will choose a nickname and an avatar, then enter. Wait while the page loads. A 3D world has more stuff than most web pages. Click on the scene to make it the focus of the browser. Walk forward by pressing the up-arrow key. You can figure out how the other arrow keys work. To walk fast, hold down shift while you press the up-arrow key. To have a meeting walk to the chairs in front of you and click on the blue sphere. Click the mic (bottom line) to turn on voice. Or type in the chat bar, bottom left. Chrome is most dependable for voice. Others may work or not. When you click on the mic, a panel will appear in the upper left, with names. If there is another person there, look for green parentheses next to names. People who have green parentheses by their names should hear each other talk. If you have talk problems, click Reset Voice.